~Rahul Dravid led India to a historic Test series win, against the West Indies in their home soil in 2006. Since 1971, India had never won a Test series in the West Indies. This is also their first prominent series win outside the Indian subcontinent (barring the win against Zimbabwe in 2005) since 1986. ~Under Dravid's captaincy the Indian team tied the previous record of most consecutive One-Day International wins for an Indian team thus equalling the record run that the Indian team had achieved under Sourav Ganguly in the 2003 World Cup in South Africa. ~During his captaincy the Indian team broke the 14 match West Indies record for most consecutive won matches in One-Day Internationals while chasing a total. For this 17 match run, Dravid was the captain for 15 matches and Sourav Ganguly was the captain for the other two. This streak was broken on 5/20/06, when India lost to the West Indies by one run, at Sabina Park, Jamaica. 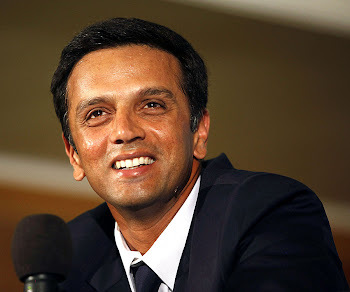 ~Rahul Dravid is the first captain to lead India to a Test match victory against South Africa on South African soil. ~He became only the third captain from India to win a Test series in England. This feat was achieved after 21 years. The other two captains being Kapil Dev (1986) and Ajit Wadekar (1971).